i love episode 119... so much so, i wanted a wallpaper for my desktop... but geuss what no ubber awesome images from there has been done yet... so i make Bleach Bankai Ikkaku vector wall! 8 hours in photoshop, i left alot of lines in there jagged state because after 9 hrs straight i gots tired T_T, ill try to go back and fix them sometime! As Always Comment and enjoy. wow! a really cool looking wallpaper you got there :D you did a great job! thanks for sharing! 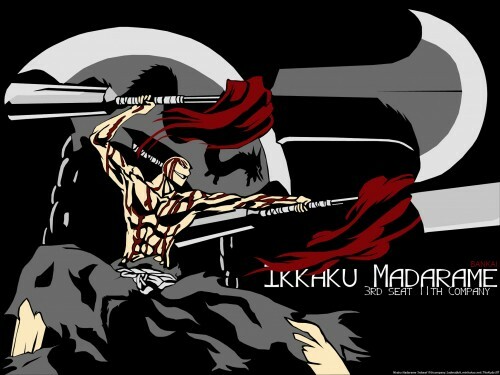 Ikkaku's bankai is awesomeness in purest form, indeed. Don't quite get the monk's spade, though. F**king awesome, man! Ikkaku rocks! Hell yeah! Ikkaku is the man. Thought the same thing when I firs saw this episode! Was awesome when he used it in the Bleach Movie 2: The Diamond Dust Rebellion.